For a kitchen sink with generous drainage, you won’t find anything better than Everhard’s NuGleam™ 1080 1 & 3/4 Bowl Sink. Featuring bold and stylish looks, NuGleam™ sinks are designed to complement the interiors of any kitchen. 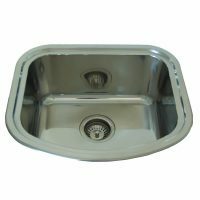 This sink is available in a left hand or a right hand bowl configuration and is suitable to be used with garbage disposers. This top-quality product has been manufactured using fine grade 304 steel. It features a full size bowl and a 3/4 bowl. Drainers and a chrome basket waste included. 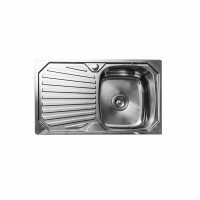 You can also choose to purchase optional accessories such as a wire basket, a wooden chopping board and a stainless steel draining tray along with this unit. 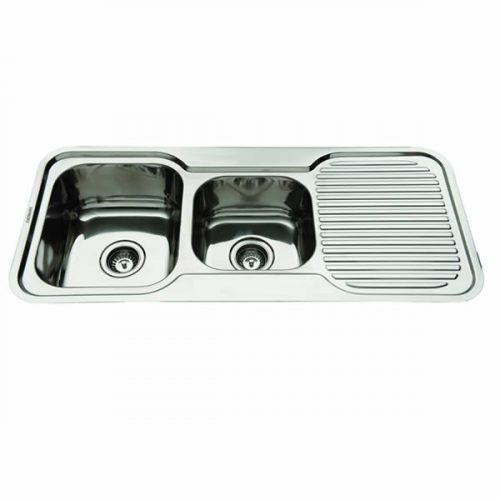 As a mark of quality, Everhard offers a 25 year guarantee on the stainless steel bowls and a 1 year guarantee on all plugs, wastes and accessories. This sink is designed to withstand years of substantial usage, so you can go ahead and buy this product with peace of mind. Do not delay! 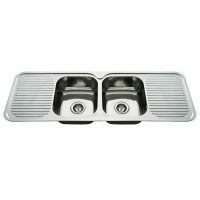 Make your kitchen more functional with this versatile Everhard kitchen sink. Buy the NuGleam™ 1080 from Ross’s Discount Home Centre at a great deal!